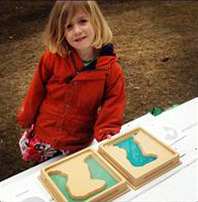 Little Peeps Montessori Naturskola is the First Certified Nature Explore Classroom located in the state of Rhode Island. Cindi Rapoza, owner, director, lead teacher states, “What makes our program unique is that the teachers are very spontaneous and embrace all weather. Nature is the center of our school”. 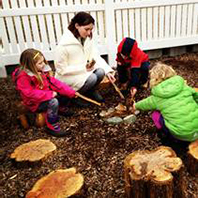 This school community has developed into a family atmosphere with older children helping the younger children and all the children working together to take care of the space, the pets and each other. The entry into the outdoor classroom sets the tone of the whole school. Along the ramp to the outside, clipboards are hung with artwork, unit studies and other documentation of learning and progress. Cubbies, located in the mud room house all weather gear from puddle pants, hiking hats, extra boots, socks, snow pants, gloves and reflective vests. The yard and school are rented and shared with a church; so many items need to be brought outside each morning. Permanent signs were not permitted, so staff met this challenge with a decision to use small, removable, gardening stakes to designate spaces. 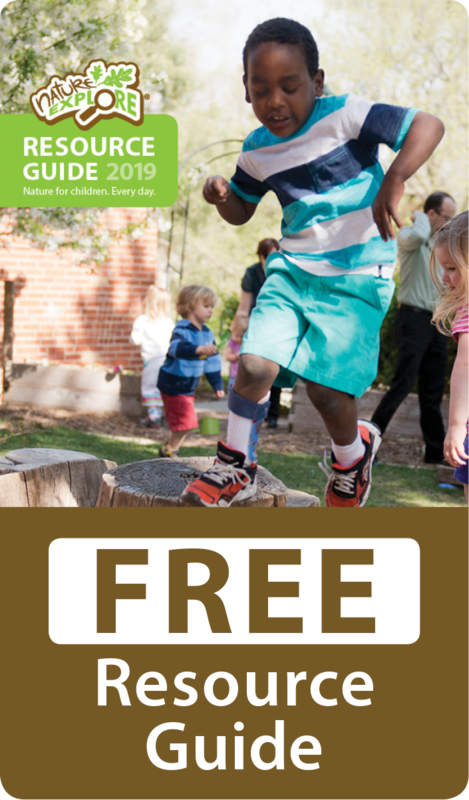 The outdoor classroom is located within the fenced area of the yard, but adventures are not just limited to the property. 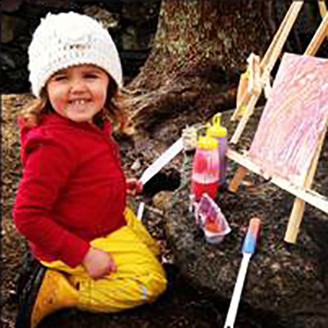 Nearby areas provide extra opportunities for children to get messy, hike, take risks and make discoveries. A neighborhood hill provides a place for yoga, log rolling and sledding. Climbing areas can be found throughout the adjacent forest and beach. The school benefits from work with the Audubon and The Nature Conservancy. Study boxes from Audubon are explored monthly. Each day after rest, children participate in “Nature School” from 2-4 pm and are outside all year round and in all types of weather. This includes daily walks off-site into two miles of trail, including ponds and meadows. Nature Art happens everywhere and is very important to the children and staff, providing opportunities for exploration and expression. 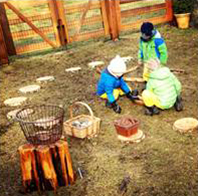 Inspired by Reggio, the children explore uses of plants and other natural materials in creating art. 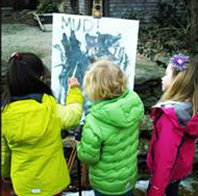 Painting with flowers, using snow as a canvas, piecing together a collage of leaves, pressing acorns into clay and keeping nature journals are just part of a wonderful nature based curriculum. A nature mobile is hung in the middle of the indoor classroom that children continue to add to. Caring for the environment is learned through helping in the classroom. Children assist in washing the fence, hanging clothes and rags out to dry, caring for the animals and helping to keep the boat and all areas clean. 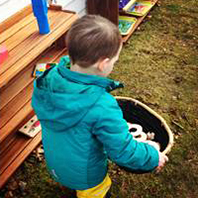 Inside and outside, natural, durable materials are incorporated throughout the Montessori classroom. Everything is chosen for beauty, quality and durability, while being engaging, attractive and at an appropriate level for little learners. · Naturskola Newsletters are sent home monthly containing information on what’s happening at the school. · Parent and Teacher collaboration evenings are held to discuss unit studies, upcoming events and to share resources, documentation and ideas.